I'm currently in Nepal, and have been experiencing the beauty of the town Pokhara, which I wrote about in one of the Japan Times articles I published in 1999. Only 11 of the original articles I wrote made it into the book as full fledged chapters, and 11 others undortunately did not. This article is about a quirky sage of a man named Ichikawa. Here's one that didn't but indeed is full of much of the same spirit. I hope you enjoy it. Ever since he was a boy, Taizo Ichikawa wanted to be a saint, to attain enlightenment. "I don't know why I was so interested in achieving satori," he tells me as we sit at the table of his small shop in the mountain hamlet where he lives. "Perhaps I did some kind of spiritual training in a previous lifetime, but I died before I reached that state. Or maybe the reason was just that I was got angry so easily when I was young. I wanted to become a more gentle person." It's hard to imagine this peaceful and unassuming man with his goofy smile, thick black hair and ready laugh as a volatile youth. He does, however, often have a look of merriment and even mischief in his large expressive eyes, as if he is privy to some secret joke. Pokara, Ichikawa's shop, also has something of the preposterous to it. Besides its location on the virtually deserted main street of a village five hours from the nearest prefectural capital, there's the utterly incongruous nature of the items for sale. One may buy or borrow books on transpersonal psychology and Steiner education, partake of a steaming bowl of noodle soup, purchase Hawaiian necklaces, woven sandals, Indian incenses or Uruguayan ceramic owls. Or, alternately, one can order a tall glass of beer. On the wood-paneled walls--giving the shop a kind of rural cosmopolitanism--are a number of finely rendered line drawings hand painted by women from the northern Indian village of Mithila, a place on the other side of Asia, perhaps similarly remote. In the background quiet flute music fills the warmly-lit room. "I want this to be a place where people walk in and say 'Aaah,' and their body drops all of its tension," Ichikawa says. "Some people have never experienced a state of complete, utter relaxation. They don't even know what it feels like." 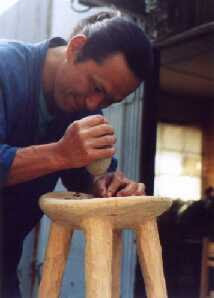 Ichikawa opened his shop originally, he tells me, as a place to hold holistic and transpersonal psychotherapy workshops. "But," he laughs, "there's no one to lead them!" Seemingly illogical business concepts like this reflect Ichikawa's approach to efficiency and rationality--he doesn't put much stock in them. He admits, for example, that the few other homesteaders in the village to whom Indian folk crafts or books on spiritual psychology might appeal "are poor like me;" and the ordinary villagers, who are mostly in their seventies and eighties, don't show much interest. Still he doesn't want to leave this remote area and move the shop to where there might be more traffic. "Here is good," he says. "At night, the sky is full of stars. Also the water is pure and the air is clean. I can make enough money to survive selling beer and ramen to my three customers, and that's enough for me." Since becoming the cook, bartender and sage of this tiny, one-room establishment a year ago, he has rarely returned to his homestead several kilometers up the road. The rice fields that he assiduously cultivated for seven years have become choked with weeds, and the house itself looks almost abandoned. Characteristically, he doesn't appear to mind, except to joke about it to his visitors. He's clearly doing what he wants to be doing. Absurdist ventures have apparently inspired Ichikawa from early on. He first got the idea of going to India from a story he read when he was in junior high school. "This guy," he tells me in an animated voice, "was traveling through India without any money when he discovered a large stone statue of the Buddha that he really liked. In spite of the fact that he had almost no money, and that the statue was big and heavy and made of stone, he bought that statue, put it in his rucksack, and carried it everywhere with him. I knew then that I wanted to do something like that someday myself." Before he left Japan however, he worked for several years as a road construction laborer in Tokyo. "I even tried college for a year!" he says. "But soon I could see that everyone around me was on a career track. They wanted to graduate and enter some big-name company. I got afraid that if I was around that kind of thinking for four years, I would become like them. I didn't want to have that kind of life ahead of me." He spent years traipsing around India, off and on for a decade or more, before returning to search for a place in the mountains of Japan. I asked him about the name of his shop. "Pokara," he says, "is the name of a town in Nepal at about 800 meters of elevation. And just next to it, right up against the town, is an mountain ten times that high." As he says this, he holds his head down and his shoulders hunched and looks up and to the right, a sly grin on his broad-featured face. It's as if he's re-experiencing being a tiny human figure in such a landscape and inwardly laughing at how ridiculous we are. Ichikawa crushes spices for some chai! I see this same expression of both amusement and awe in Ichikawa a lot, as though he were standing next to that mountain most of the time. "In India," Ichikawa tells me, "I became baki-baki ." It's a word I don't know, but he laughs out loud when I reach for my dictionary. "You won't find it in there! I made that word up myself!" "Baki-baki means being connected with the universe, it means the microcosmos and the macrocosmos are intertwined, in sync, it means transpersonal; it means satori, love, tons of it, full up to the top." Ichikawa then hands me a box filled with flyers and pamphlets for workshops he has attended in diverse areas such as energetic healing, the Alexander Technique, reiki, butoh dance, solo performance, kinesthesiology, and left-right brain integration. "I want to have workshops like that here," he says, "because a lot of people are out there suffering, and they don't know why. Maybe when they were very small, they were hurt emotionally in some way, but they have no consciousness of that trauma now. They just know that they are suffering. Even if they think about it intellectually, they still have no idea why. "So when they are relating to other people, they say things that they really don't want to say, and they are unable to speak the things they do want to say. It's all unconscious however. In the end they become exhausted and depleted of energy, sick, low-spirited, and downhearted. "I want to help people solve such problem themselves, and then use that understanding in their everyday lives." 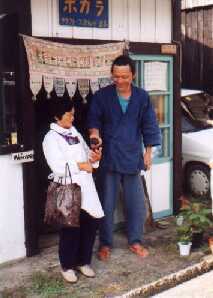 For Ichikawa, helping other people is directly connected to his own fulfillment and happiness. "My purpose in life, and that of human kind, and that of the earth are the same, absolutely," he says. "That's what I mean by transpersonal, by baki baki. The earth is a single life form, a single soul--the whole planet is a single body of life. I myself am just one cell in that body, that entity. "My individual purpose in life is to be vibrant, alive and vigorous, and to continue on that way, full of spirit, healthy and energetic, endlessly. I will die and be born again, come into the world, and pass away, be born again and vanish. That's also the purpose of the human race, and the purpose of the whole life-planet, to continue on, healthy energetic and alive." "This is not a thought in my head, and it's not a belief. I am totally uninterested in belief, because belief means 95%, belief means conceiving of something with your brain. What I am talking about is an understanding, a felt thing in my body, something I know intuitively. It happens in an instant, and it's an absolutely sure, 100% thing." "That's why I have given up on negativity. I used to go around saying 'this thing is bad and that is bad,' naming the problems in Japan--pesticides, nuclear energy, destruction of nature, the behavior of politicians. But it only made me feel worse all the time, brought my energy to a lower level; and what's more, it probably didn't accomplish anything. So now I try to just be positive, saying 'this is right, and that is good!' "
"Was there any other major influence you got from your years in India?" I ask. "Well, one thing I noticed is that on an Indian bus, if you sit next to someone, you always talk to them. Japan isn't like that at all. That's why I only have one table here at Pokara, this is a place for people to talk, and, maybe, hopefully, to raise each other up."